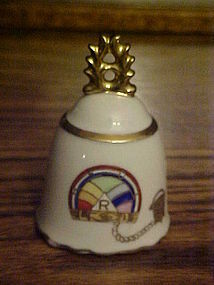 Rebekah lodge porcelain bell. 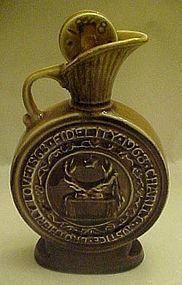 It has the symbol of the fraternal organization in the center and has a unique handle at the top with little open work. It is about 3 1/4" tall. It is lavish with gold trim! There are no cracks or chips, and has the original porcelain clapper. This nice old piece was distributed by Cherryco Originals and still has the 2 original red paper stickers as well and the Chubu China mark onto the bottom with the number 3542 Hand painted. Pretty demi size cup and saucer with orcids and lots of lavish gold trim. 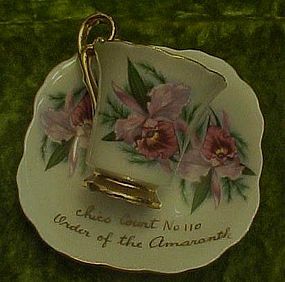 a presentation for the chico court # 110 order of the Amaranth. Order of the Amaranth is a Masonic-affiliated women's organization founded in 1873. 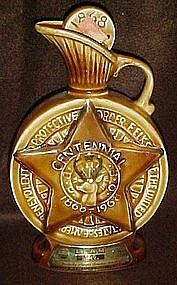 As in the Order of the Eastern Star. 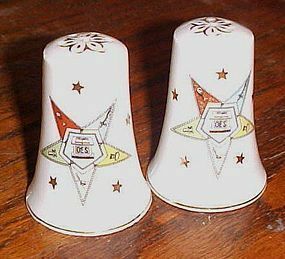 Saucer measures 4 3/8" in diameter and cup is 2 1/2" plus handle. 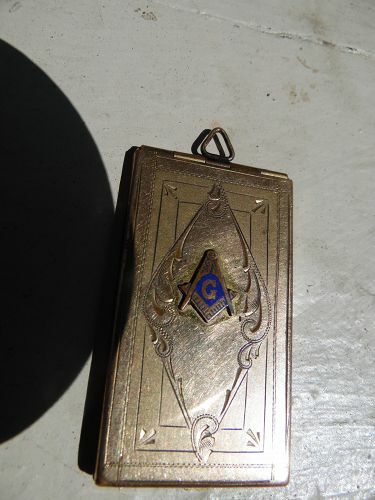 Fancy gold handle! both pieces are in excellent condition. 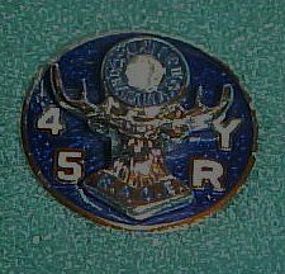 Vintage Elks Lodge Tie Tac B.P.O.E.. Benevolent and Protective Order of Elks Vintage Elks Lodge Tie Tac / Pin, marking 45 years of service / membership. Not sure if this is a rhinestone, or diamond. The background is a deep royal blue but shows lighter in the photo. 3 dimensional. This is so nice and in great condition. Measures 5/8" dia. 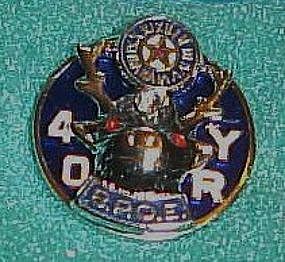 Vintage Elks Lodge Tie Tac B.P.O.E.. Benevolent and Protective Order of Elks Vintage Elks Lodge Tie Tac / Pin, marking 40 years of service / membership. Not sure if this is a rhinestone, or diamond between its eyes. The background is a deep royal blue but shows lighter in the photo. 3 dimensional. This is so nice and in great condition. Measures 5/8" dia. 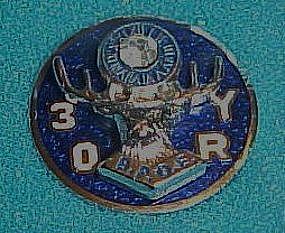 Vintage Elks Lodge Tie Tac B.P.O.E.. Benevolent and Protective Order of Elks Vintage Elks Lodge Tie Tac / Pin, marking 30 years of service / membership. Not sure if this is a rhinestone, or diamond. The background is a deep royal blue but shows lighter in the photo. 3 dimensional. This is so nice and in great condition. Measures 5/8" dia. 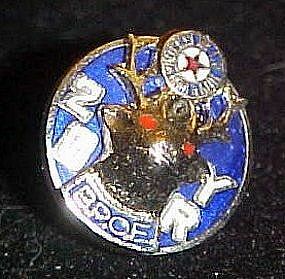 Vintage Elks Lodge Tie Tac B.P.O.E.. Benevolent and Protective Order of Elks Vintage Elks Lodge Tie Tac / Pin, marking 35 years of service / membership. Not sure if this is a rhinestone, or diamond between its eyes. The background is a deep royal blue but shows lighter in the photo. 3 dimensional. This is so nice and in great condition. Measures 5/8" dia. 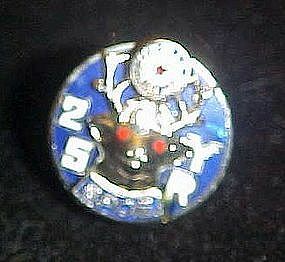 Vintage Elks Lodge Tie Tac B.P.O.E.. Benevolent and Protective Order of Elks Vintage Elks Lodge Tie Tac / Pin, marking 25 years of membership. Not sure if this is a Rhinestone, or diamond between its eyes. The background is a deep royal blue but shows lighter in the photo. 3 dimensional. This is so nice and in great condition. Measures 5/8" dia. Vintage Elks Lodge Tie Tac B.P.O.E.. Benevolent and Protective Order of Elks Vintage Elks Lodge Tie Tac/Pin, marking 15 years of membership ?Not sure if this is a Rhinestone, or amethyst between its eyes. The background is a deep royal blue but shows lighter in the photo. 3 dimensional. This is so nice and in great condition. Measures 5/8"dia. A presentation dish from a ladies club for the Associate conductress. Not sure which organization this was for. 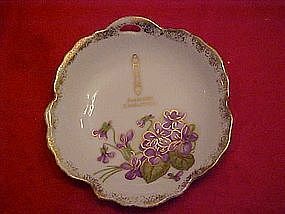 It has a design of violets with lots of gold trim and measures 5" in diameter. On the back it reads, Bone China by Audre' 229 S.Lomita-Burbank Calif. Phone 848-5917. Perfect condition.